Our pace on Nomadness is not one of rushing from place to place, but rather the pace of introspection. 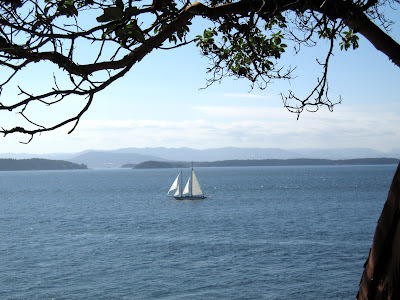 We spend a day sailing (Friday Harbor to Stuart Island was idyllic) or motoring, and then anchor for a few days, puttering about in kayaks or hiking. I bake things. Steve does projects. We play our flutes. We enjoy where we are. So, although we haven't gone far horizontally, we go deep vertically. Years ago, Sam Smiley, a former professor and writing mentor, spoke of analyzing films based on the horizontal and vertical axes. The horizontal axis being what happens, the action and events of a film. The vertical axis being the depth of character, feeling, and/or impact on the viewer in a film. Great films move along a horizontal axis but have enough depth to make us care about the characters, perhaps identify with their dilemmas and maybe even impact our lives, or deepen our understanding. I grasped this concept and immediately began applying it to my life in general. On Stuart Island we walked to the light house to watch boats pass as they struggled in the rips off Turn Point. This is the schooner Martha under full sail. Martha is a historic schooner offering youth training programs and more. What a sight she was! Later she anchored in Reid Harbor with us where we got a close look. We listened in on the whale watch captains on the radio. They try to keep the frequency a secret, but with a hammy geek on board and several radios, we figured it out by receiving on one radio while transmitting tests on another until we hit it. The orcas were evidently near, though precisely where, was difficult to discern from the captains use of code words. So though we didn't catch a glimpse, it was exciting to eavesdrop on the chatter about J2, the lone unidentified male and the group of females feeding and frolicking in the nearby waters. Eventually, we are bound to see or hear them. Steve has a hydrophone on board. We are ready! On the way back from Turn Point we bought touristy but quaint T-shirts from the honor system treasure chest the islanders set up to raise money for the school kids. You take what you want and mail in payment later. I only wish everyplace was as trusting and open as this. 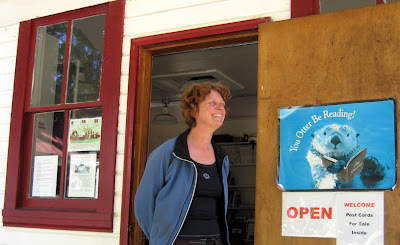 Here I am at the tiny little library. So, Nomadness travels both the horizontal axis and the vertical axis making a track both across the map and deepening our character with experience. In fact, I've had to reassess my prejudice against powerboaters (formerly considered inconsiderate and wasteful) as we continue to meet interesting, conscientious folks on powerboats like Larry and Nancy on the trawler, Jacari Maru whom we hope to rendez-vous with in the Gulf Islands. They were a wealth of friendly knowledge and gave us lots of advice on the best spots to anchor in the Gulfs, where to get free wifi access, good grocery stores, farmers markets etc. It is always useful to see my own prejudices dissolve leaving greater tolerance in its track. Speaking of tracks, if you'd like to follow our progress (on the horizotal plane) check out our APRS track. Well be heading into Canada soon, and once we do, postings will be limited since we will get "roaming" charges. (Shouldn't roaming be free and encouraged for all? )Heck we're already seeing roaming charges, and we're still in the USA! But with amateur radio nuts everywhere our little tracker signal should get bounced out into the net for you to see. As for the vertical plane... well, there is no tracker that can follow us into those realms. We'll just have to see where this journey will lead. "So, Nomadness travels both the horizontal axis and the vertical axis making a track both across the map and deepening our character with experience." That really touches me and resonates. How beautiful and how precious. And thank you both for letting us share a little of that experience with you vicariously through your blogs! P.S. : Girl, you have one of the most lovely smiles. I'm sure Steve agrees. haha! I could have simply said "loveliest." Yeah, superlatives are good, and appropriate when used to describe Ms. Sky.